With over 3,000 class hours of training, this program teaches students western anatomy, physiology, pathology, homeopathy and Traditional Diagnosis and treatment methods including body and ear acupuncture, tui na massage, herbal formulas and prescription. ﻿IMPORTANT: ﻿If you are looking for a acupuncturist, make sure you seek out one who is Licensed, not certified. A certified acupuncturist has only received 100-200 hours class hours, and that does not include clinic. A licensed practitioner has over 3,000 classroom hours plus over 800 clinic hours. The field of Acupuncture and Oriental Medicine is a unique, advanced approach to healing requiring years of specialized training. Without this, one has no standard to qualify as a good acupuncture physician. “I have known Andrea professionally and personally for 5 years. As a physical therapist she has been a great referral source for everything from chronic pain to post menopausal symptoms. 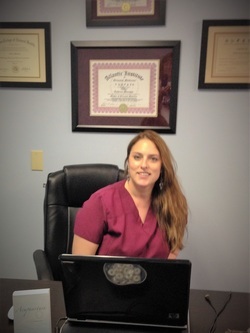 I have always gotten positive feedback from each patient that has seen Andrea. Physical Therapist, Oceanside Physical Therapy, Inc. Administrator of Alpha Institute and Certified Chiropractic Physicians Asst. “I had always heard about acupuncture, but was hesitant to try it. However, after meeting Andrea, I was put at ease and have been a patient of her for the last five years. Through acupuncture, I am able to have a regular monthly cycle and the cramping and moodiness that came with it significantly reduced (which my family is thankful for). I have also benefited from acupuncture for stress, neck and back pain, allergies, and blood pressure. Since I was so confident in Andrea, I brought my husband and son to see her as well. My son, who is eleven, likes to see her for stress reduction. He usually falls asleep during treatment and is very relaxed afterward. Being an eleven year old can be stressful with all that schoolwork and preteen hormones running amok. As for my husband, he decided to quit smoking and I convinced him that Andrea could help him through acupuncture. After a few weeks of treatment and lifestyle changes, he stopped smoking. The acupuncture helped reduced his craving for cigarettes and kept the stress from the withdrawal to a minimum. He now sees her for continued stress management as well as back pain and sinus issues. "I want to express how great acupuncture has worked for me. I had hamstring tendinitis that flared up in the Melbourne race last October. To make a long story short I have seen 3 doctors, 2 different physical therapists, and received a steroid injection. I could swim and bike, but running killed my knee--the last PT claimed the problem was my Iliotibial band, so I bought an IT band compression wrap and tried running with it on. The pain and discomfort was unbelievable. Traditions race came and went. I was getting bummed that I could not compete. I even thought about finding a relay partner to do the run-I was getting desperate. I was on the verge of giving up racing this year when I remembered an e-mail about acupuncture. I have been to see Andrea four times. I did my first brick yesterday and had no pain, I wish it had not been "my last hope" move on my part. I highly recommend her to everyone."